Between Pushkin's Boris Godunov in 1825 and the first version of Musorgsky's opera (1869) there is gap of almost half a century. And not just any half century: the subject was made into high literature by Pushkin while its musical setting bears the mark of the age of Dostoevsky. In Musorsgky's crooked dramaturgy, the turning points are hidden from our gaze and ears. Only the turmoil resulting from these invisible and inaudible moments of drama is available to our scrutiny. It may be no coincidence that the intended director of this production was Peter Stein, fresh from directing a harrowing theatrical adaptation of The Demons. The production's director, Stephen Wadsworth, summoned at short notice after Stein's sudden cancellation, did not shroud us in Dostoevskian bleakness, as Stein would probably have done. Instead, he and set designer Ferdinand Wögerbauer drenched the stage in the glare of gold and red (the Kremlin's colors), whose brightness sets off the opaque timbres of the orchestral score. The action is kept deceptively simple, with two recurring features—a throne and a giant open book—threading together in what would otherwise be an almost random sequence of tableaux. The latter is particularly impressive. 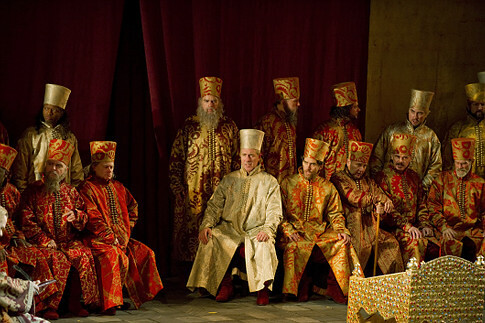 First introduced as the chronicle produced by the old monk Pimen (which records the regicide of which Boris is guilty) the book stays ominously open throughout the opera as the symbol of the unfolding of history. René Pape's Boris is likely to become a classic. Broad phrasing, flawless projection (a remarkable feat with a bass voice) and impassioned expression lent depth to this most complex of operatic characters. Boris is guilty of murder in a world where lack of moral backbone is the norm rather than the exception. Musorgsky sets his impassioned recitatives against a world eerily saturated with folk melodies. Pape's Boris is also a tsar devoted to his people: to him, power is duty and responsibility rather than the object of blind ambition. As with Dostoevsky's Raskolnikov, then, the murder of the tsarevich is a necessary sacrifice towards an ultimately good deed, at least in principle. Yet the break with the moral order he makes with the murder will ravage him like a sickness. Pape has Boris continually faltering, clutching aimlessly at the world around him. Perhaps the most poignant aspect of Boris' tragedy is his failure to lead or connect with his people. The people who flood the gates of the Kremlin on his coronation are a police-taunted, starved and hopeless crowd with little faith in their rulers, and their stage and musical presence is the soul of Musorgsky's opera. 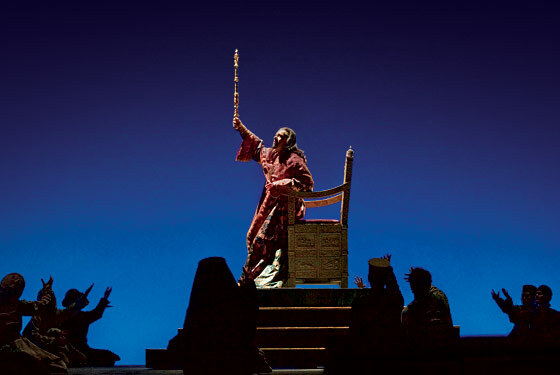 The Met chorus took a couple of acts to come into its own, but when it did—especially in the first scene of Act IV—it made up for its slow start, and the recurring off-stage pilgrim choruses were always exquisite. Valery Gergiev's nuance with the treble layer of the score (most obvious in the shimmering hues of the Act III love duet) could have been complemented with a more immediate sense of orchestral weight: the sinister lilt of the famous coronation scene chords was too fast for those famous radical harmonies to truly ring. Still, it must be remembered that Gergiev is deliberately working with Musorgsky's original orchestration, which is starker and barer than Rimsky Korsakov's later (and more often performed) version of Musorgsky's score. Much talent was also to be found away from the madding crowd and the orchestra pit. The pretender, played by Aleksandrs Antonenko, shone the Act III duet with Ekaterina Semenchuk, whose full low register enshrouded the role of Marina with suitable darkness. The tuneless wailing of the holy fool (the very voice of the Russian people so inaccessible to Boris) was delivered very poignantly by Andrey Popov.